The all-new Mazda CX-5 is that crossover SUV packed with safety features you'll appreciate. The Mazda CX-5 can even help you to avoid a collision on the road. If there is something in your path as you are driving, the Pre-Collision Assist system identifies the threat and flashes a warning to slow down the vehicle before it automatically will pre-charge the brakes to stop you in time. 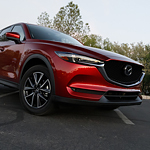 The reason the Mazda CX-5 is safer on the road is because the Blind Spot Information System is using sensors to monitor behind the vehicle for other cars. If the sensors pick up on a vehicle moving into a blind spot, your side mirror flashes an alert so you maintain your lane and keep from hitting another car. To see the features in the Mazda CX-5 in action, all you need to do is visit us at Dolan Mazda and get it on the road for a test drive.